MADD aka Mothers Against Drunk Driving have always been good at finding cleaver ways to promote their anti drinking and driving campaigns. Another almost shocking anti drinking and driving ad is the 3D drinking and driving bathroom sticker ad. 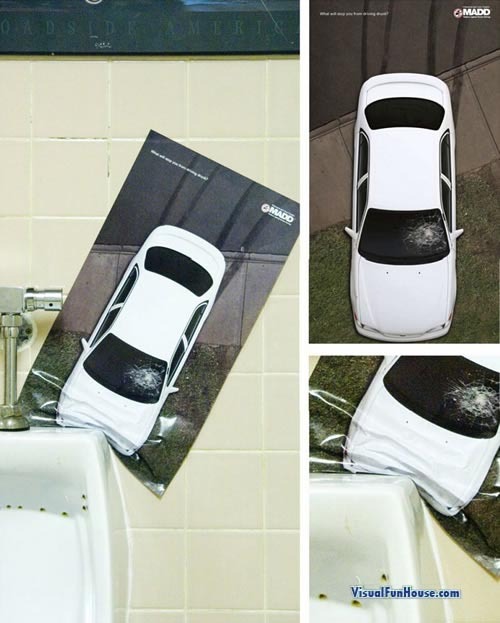 The Ad below uses a poster of a car that skidded out and crashed into the urinal, with just some pre printed skid marks and a bit of crinkled paper this ad gave me a chuckle yet still manages to make a good point! So remember boys and girls, don’t drink and drive. I guess you cant miss it. It’s in a good spot. Now they even put ads in bathroom stalls.